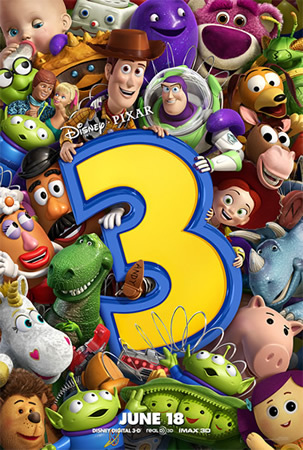 Disney-Pixarâ€™s most anticipated film of the last 11 years, Toy Story 3 finally opens in theaters this Friday, June 18th in Disney Digital 3D and the original â€œToy Storyâ€ cast is back! Now, Woody, Buzz, and the gang are on a mission to figure out where they belong as Andy heads to college. The film is a comedic and heartwarming animation that takes you on quite an unpredictable adventure as the toys fight to survive. Even after all of these years, Disney-Pixar manages to create a film that will go down as a classic. Viewers are taken on memory lane as the film opens up and are emotionally sucked in with the failure of â€œoperation play time.â€ Following this failure, there are a series of unfortunate and equally exciting events, thanks to the introduction of Sunnyside Daycare and a daycare employeeâ€™s child, Bonnie. Barbie and Ken also play a big role in the film and Buzz has been reset to his demo mode again! The latter is not a driving force in the overall plot, so it is a welcome throw back to the previous films. What is also a welcome throw back is â€œThe Clawâ€ which comes back in a big way. In the end, when it seems like it is the end for the toys, the gang is saved and are welcomed with open arms to their respected owner. Woody is given over with some hesitation and this moment was created perfectly. The ending is an ending that will exceed your expectations and make you shed a tear, saying, â€œSo long partnerâ€ as you leave the theater. That is, after the end credits roll, since there is more resolved as the credits run. The IMAX 3D experience is the best viewing experience you can have watching this film. The visual quality is astounding and is able to keep viewers enthralled by the film, not the 3D aspect. The 3D aspect does not distract or take away from the story. It enhances the story in a beautiful way that you will be glad you spent your money on. Toy Story 3 is the must see film of the year. Make sure to go see it as soon as you can. Toy Story 3 is directed by Lee Unkrich and stars Tom Hanks, Tim Allen, Joan Cusack, Don Rickles, Wallace Shawn, John Ratzenberger, Estelle Harris, John Morris, Laurie Metcalf, R. Lee Ermey, Jodi Benson, Ned Beatty, Bonnie Hunt, Timothy Dalton, Jeff Garlin, Whoopi Goldberg and Michael Keaton.